AKA how I am a DIY poser! I love Young House Love, and Sherry's collaboration with other bloggers to make the Pinterest Challenge happen is one of my favorite things. I have participated before (making leather accessories in March, and organic dog treats in November), and had such good intentions to come up with an even better project this time, BUT (you had to have known a "but" was coming)... life got in the way, friends came into town, the fabric store closed on Sunday... and I didn't "get around to it"... whomp whomp. A fox nightlight for my nieces! So as it turns out, my nieces might be 14 and this thing might turn out to be the Quasimoto of foxes by the time I am finished... but I. WILL. DO. IT. Have you been working on any DIYs lately? I am going to head on over to the big Pinterest Challenge reveal to glean some inspiration, and you should too! I love that nightlight!! Such a cute DIY. I’m looking to move at the end of the Summer, which means i want to totally redo my bedroom. I’m looking into revamping old furniture with some TLC and love - definitely checking out pinterest for inspiration! What a cute, fun DIY! No, I haven't done any DIYs lately. (I have a list though!) There always seems to be something else to do though. I need a day to just CHILL and blog, work on projects, etc. dan saya akan mengikuti terus.. I kind of love your pug. Such a cute idea!! The fox is so cute! Great DIY!! is really cute. Please visit our blog!! It is about fashion and culture but we have some DIY too!! I love this project! It's too cute. The only DIY I did lately was dip dyed shorts and it was so fun. That is so cute!! I have so many unfinished DIY projects laying around that I really need to get to though, haha. 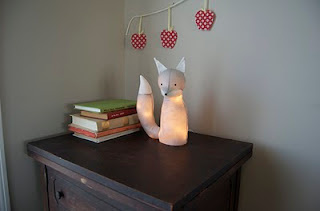 The fox is so cute,it would be perfect for my little girl,i sm just not really a DIYer:(. thank you so much for stopping by my blog,i really enjoy yours too. The pink jcrew bubble neclace ias that from jcrew or ebay. I am still think which way to go. That fox light is seriously adorable! I would put that up somewhere in my apartment! wow that fox light is adorable.